Funny how projects that would be holocausts for Earth never seem to stay dead. Look no further than the proposed Pebble Mine in southwestern Alaska's Bristol Bay. In 2002, after deposits of copper, gold, and molybdenum were confirmed to the tune of $300 billion, the dream of a huge open pit mine was born—with a proposal to remove 10 billion tons of rock, create two artificial lakes over four miles long, and construct a mine as deep as the Grand Canyon and as big as Manhattan. During the Obama Administration, Alaskans and other groups successfully fought to get the Environmental Protection Agency (EPA) to declare the area off-limits to mining under a rarely-used provision of the Clean Water Act. The agency eventually declared that the mine would result in the “complete loss of fish habitat” due to the destruction of 22 miles of streams and more than six square miles of wetlands. But it only took an hour after a meeting between President Trump’s EPA-head Scott Pruitt and the CEO of the Pebble Limited Partnership for Pruitt to reverse that determination. His decision now allows the permit application process to move forward. Problem is, that part of Alaska is the last place in the world that a mine should be built. 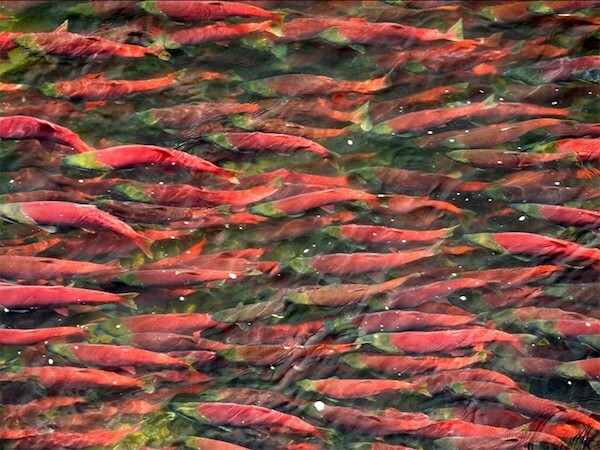 Fifty-six million sockeye salmon call Bristol Bay home—making it one of the last, great salmon fisheries on Earth. Nearly half of the world’s sockeye catch comes from this one region, supporting some 14,000 jobs, generating about $480 million annually, and feeding 4,000 year-old Alaska native communities. Of course, it’s not just the Pebble Mine protections that are here today and gone tomorrow. Whether it’s uranium mining in central Virginia, coal shipping terminals in Washington, or federal land protections in the West, ecosystems and nature are just political footballs; always one election away from being trampled to death. We treat the natural environment with less legal protections than we treat our own right to carry firearms. And that is just one more indicator that we are undoubtedly the dumbest species on the planet. While our very lives depend on clean air, clean water, and the sustenance provided by this planet, we continue to treat Earth as something that can be sold off to the highest bidder without consequence. Enough already. The kind of change we need won’t come about because we “raise consciousness,” recycle more, take shorter showers or write more letters to Congress. We need a plain old revolution that elevates nature and ecosystems to the highest form of protection available under our law—that of rights. And we need to give up hope that the foxes in charge of the current henhouse will do anything to move in that direction. Three dozen communities in the United States, including the City of Pittsburgh, have been leading the way—adopting local laws that recognize that ecosystems have rights to exist, flourish, regenerate, and to be restored when damaged. Courts in India, Colombia, and Ecuador have held that rivers, glaciers and other ecosystems possess independently enforceable rights of their own. At least two countries have placed constitutional protections for nature directly into their national constitutions. In the United States, with the help of those who care about the river, the Colorado River ecosystem recently sued the State of Colorado for the gross malfeasance of governance that has almost killed off the River. Rivers with a right to flow? Yes. Forests with the right to exist? Absolutely. Wetlands with a right to do what wetlands do? Without a doubt. The climate with a right to exist without fossil fuel emissions? Bring it on. Let’s dance. And let the naysayers explain why it’s okay somehow to continue to treat places like Bristol Bay as just another dumping ground. They’re the same idiots that defended slavery, denied women the right to vote and stopped African-Americans from voting. They’re the same venal morons who brought us “corporate rights,” “what’s good for General Motors is good for America,” and “nuclear power: too cheap to meter.” They’ll say anything to anyone to continue to clutch at their avenues of wealth, control and power. If now isn’t the time to have that fundamental battle to remove their cold dead hands from our sustainable future, then I think we’ve forgotten completely what battles are for. Time to put our big boy pants on, and giddyup. Let’s go. You are trying to compare apples to oranges. The Rs and Ds are not what they were decades ago. Even Nixon wouldn't be welcome in the Republican Party today. Nixon started some of the "socialist" welfare programs that republicans today are trying to get rid of. That's so true! There was a time when the Republican party also supported legalizing abortion. You won't see that today! Then we are all dead. And all the money in the world won't bring us back to life. Republican party of today. The Republican Party was once a progressive party, but that went out the window starting with Nixon. It's been all downhill from there. "...They’re the same idiots that defended slavery, denied women the right to vote and stopped African-Americans from voting." Really? It was the Republican Party that demanded the Equal Suffrage Amendment in 1919. It was the Democrats who fought the Republicans, hoping to keep their slaves. It was the Democrats who tried to stop black people from voting after they were freed. "...We treat the natural environment with less legal protections than we treat our own right to carry firearms." So you want a constitutional amendment to allow the environment to be protected by the Bill of Rights? Sheesh. Do you get paid for writing? I hope so because I need a part-time job that pays well for minimum intelligent effort. Let conservative freedom ring. Trump & company damned sure aren't progressive libtards. Hurrah for capitalism, let the rich become richer, keep electing (what a joke) millionaires to the White House, you will always get someone that cares about the little guy and the environment. It's already too late, just give up. The only people with the power to change it are the ones that have a vested interest in all this continuing. It's over, nature lost. it's really tru, absolutely agree with the author, especially this part: "We treat the natural environment with less legal protections than we treat our own right to carry firearms. And that is just one more indicator that we are undoubtedly the dumbest species on the planet." you're damn right!